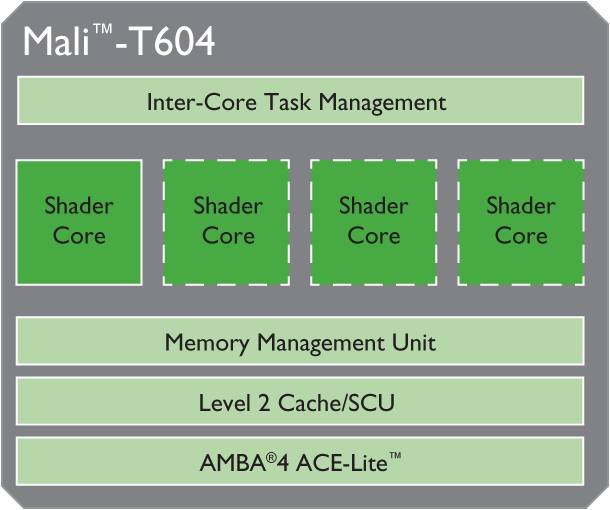 The ARM Mali-T624 is an integrated graphics solution for ARM based processors. It can be built with 1 to 4 clusters/cores. The unified shader architecture supports OpenGL ES 3.0, OpenCL 1.1 as well as DirectX 11 (Feature Level 9_3). The ARM Mali-T604 MP4 is an integrated graphics solution that launched in Samsung’s smartphone and tablet SoC Exynos 5250 with four cores. Besides OpenGL ES 3.0, the GPU also supports OpenCL 1.1 as well as DirectX 11. The Mali-T604 can be scaled from 1 up to 4 clusters/cores depending on the requirements of the chip.